About 4 miles southeast of the town of San Pedro on Ambergris Caye, most of Hol Chan (Mayan for “little channel”) was established in 1987 to resuscitate a then-drastically overfished stretch of the sea. The reserve began with three distinct habitats: a northern rim of Belize’s Barrier Reef, a seagrass lagoon, and a collection of mangrove cayes and channels. This combination alone would be snorkeling heaven. But it’s the fourth habitat, dedicated in 1999, that has made Hol Chan famous: Shark-Ray Alley. Southern stingrays and nurse sharks, once drawn by fishermen who cleaned their catches in this spot, come here in great numbers to score snacks and a little fish-on-human action. Generally gentle and curious, both the rays and sharks have been known to enjoy cuddling with people, a sentiment I can absolutely support. That said, it would be foolish to come here and simply grab yourself a toothy, barbed sea creature. Our group of travel bloggers was guided through the reserve by an excellent San Pedro tour operator, Extreme Adventures. Recently taken over by a twinkly, sunburned expat Canadian who’s so sure he’s spent his last cursed winter in Mississauga that he’s committed himself to a five-year contract, Extreme Adventures offers land-and-sea tours led by native Belizeans who love both their country and their work. The young men who guided our group were absolute rock stars. Masters of mask de-fogging and fish identification, I’ve never had a more carefree float in the sea. Our main aquatic guide pointed out green sea turtles munching on seagrass, the rare and endangered Nassau grouper, and in a huge limestone reef-rimmed “hole” that felt like a vast and glassy bathtub, rippling rays fluffed up clouds of sand from far below. By the time we’d sped along by boat to the Alley, I was relaxed enough to abandon all fear…and some would say, logic. Our captain sprinkled some food in the water and within five seconds, we were surrounded by a swirl of sharks. This is normally not the time I’d be a vanguard, but without much thought I found myself climbing into the sea and swimming ’round some telltale fins to, well, pet a shark. 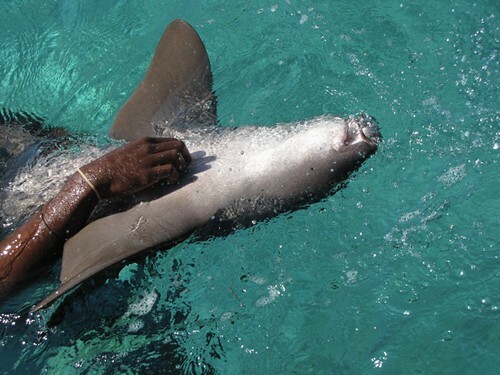 Sadly, I lack the photographic evidence — my whole group, back up in the boat, were busy staring at me like I was a crazy person — but I do have proof that nurse sharks like to have their bellies rubbed, like whiskery cats covered with wet sandpaper instead of fur. Turns out that if you’re gentle and avoid the barbed tail (oh, Crocodile Hunter…we miss you) you can also stroke some ray wings, which feel just like damp velvet. Between you and me, I wouldn’t have been so brave without a guide to make the initial shark/ray embrace, but I also wouldn’t trade this experience for all the fish in Belize. Only one thing might have improved the day: a more comfortable mask. Our entire group agreed that the rental masks provided by the company left us all with the feeling of a third-eye bruise. Fortunately, one of my fellow bloggers, Kara Williams, was testing a new Body Glove travel snorkel kit during our adventure; her product review for Practical Travel Gear led me to purchase two sets. COST: Had we paid for this Extreme Adventures half-day excursion rather than been sponsored by the Belize Tourism Board, it would have cost $35 per person and included gear rental and a (welcome) cold beverage. I bow to your bravery I would never have thought that the words “pet” and “shark” would be in the same sentence. What a unique experience that must have been! It was amazing…and curiously, a relief. After being terrified of sharks since childhood, I’ve become increasingly unsettled by reports of shark populations dwindling due to barbaric fin harvesting for soup. After my experience in Hol Chan, I have to say I’m now a bonafide shark fan. While I don’t foresee going for a swim-up snuggle with a bull shark or a Great White anytime soon, I now feel especially committed to protecting ocean and sea habitats for all sharks.